Once the standard invitations (from our regular list) and the invitations to the guests of the laureates have gone out, we have to wait until the latter half of November to see whether we have seats available. Only then can we look at requests from around the world and possibly grant invitations to some of these (we prioritise those that show a keen interest in this particular year’s laureates). I will add your name to the list of requests and get back to you when we know more. I figured my request was doomed. As expected, I got an email in November thanking me for my interest but telling me that the Nobel Peace Prize ceremony was completely full. 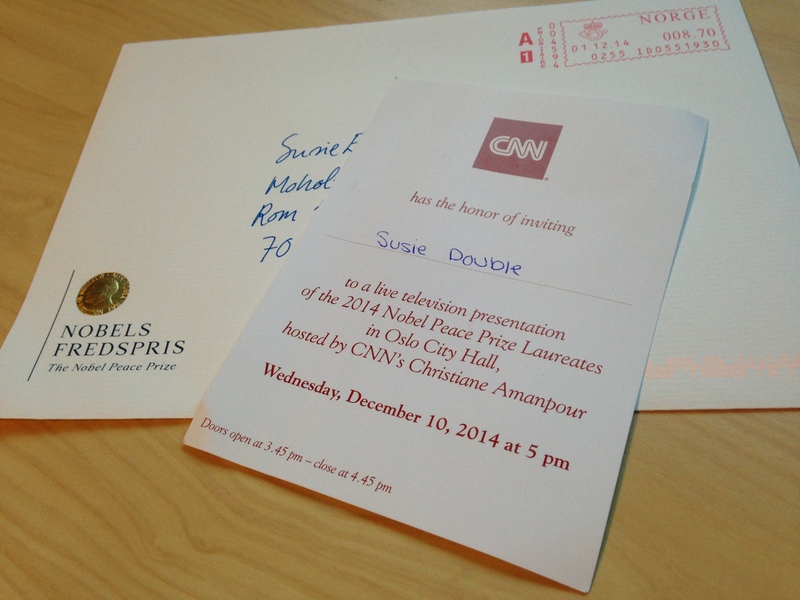 BUT to my very great surprise I was told that I could still have a ticket to this year’s CNN interview with the laureates. Considering that I was going to have a light teaching schedule that week, I immediately emailed back saying that I would love to have a ticket to the interview. 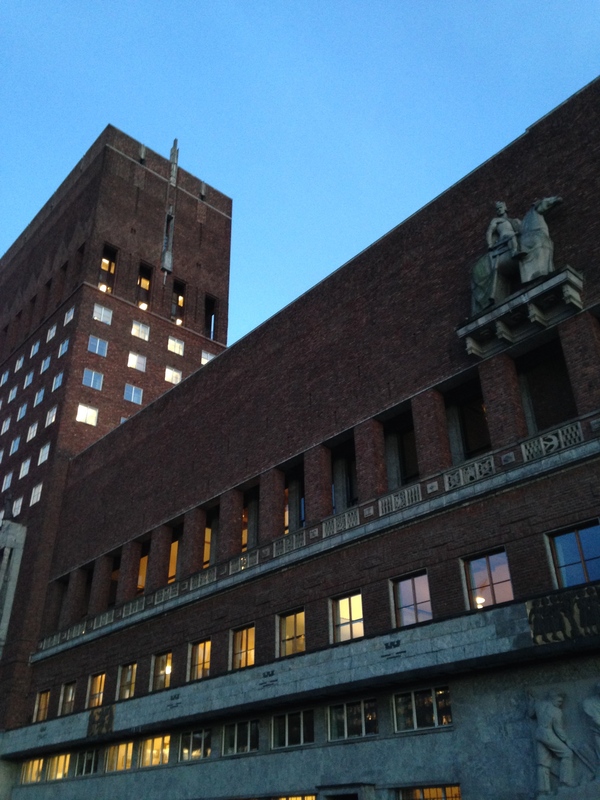 Which is how I found myself in Oslo this week. 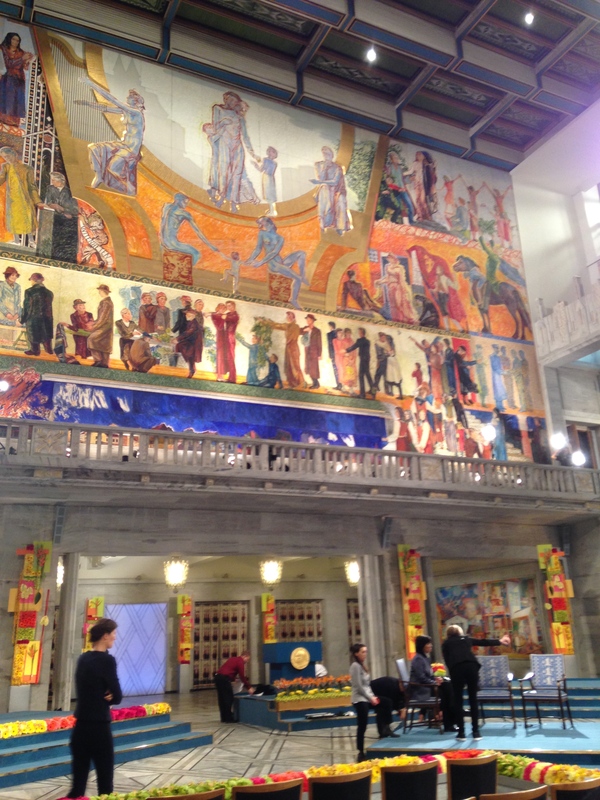 After my tour of the Munch Museum I decided against going to the City Hall area, where the Nobel ceremony is held, and instead opted to go back to Lud’s house to watch the ceremony from the comfort of a couch. 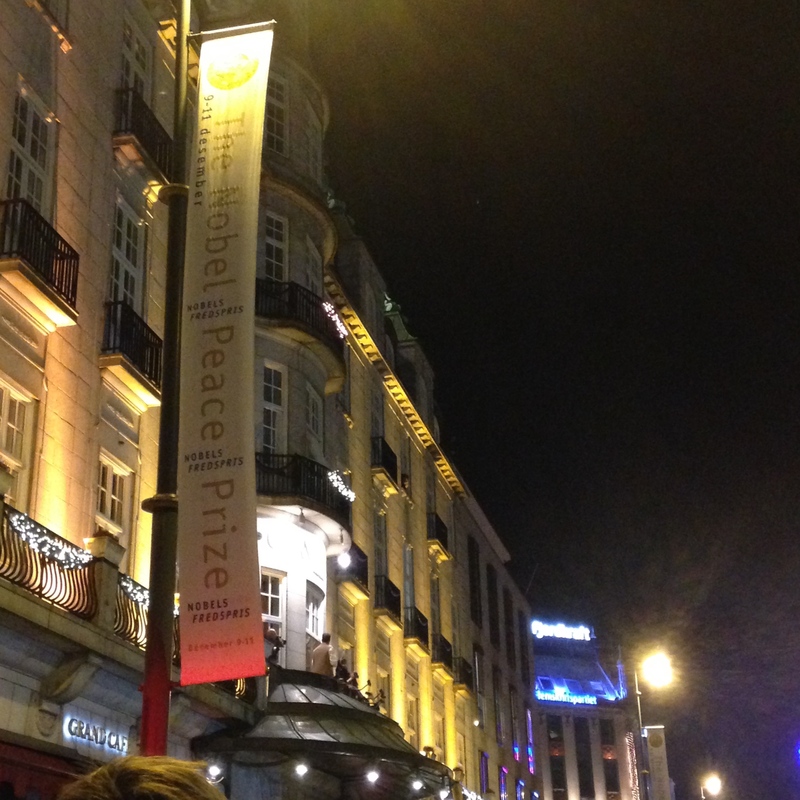 While Susan and I enjoyed watching the ceremony on television, we also kept our eyes peeled for Lud and Kyle, two of the Fulbrighters who had won the peace prize tickets. Just when we had given up all hope of seeing them, we spotted them in the last row as the laureates walked out after the ceremony. 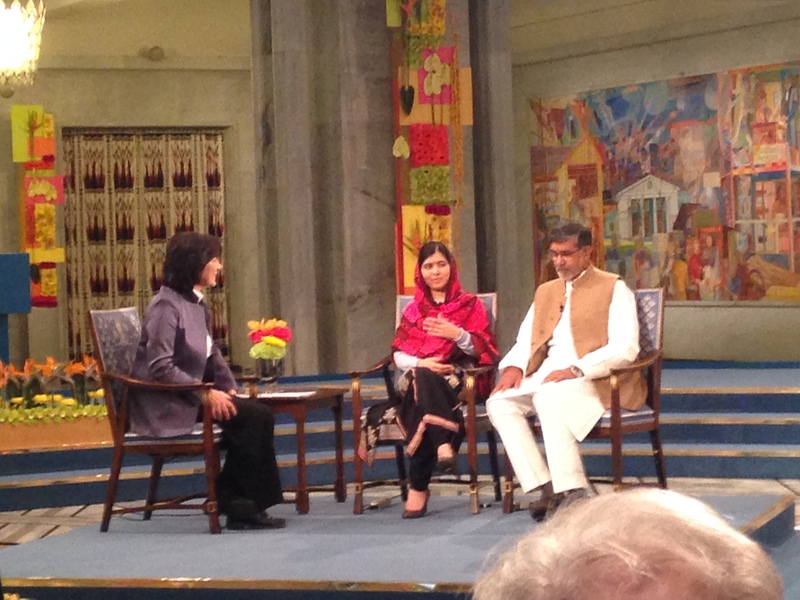 Overall the ceremony was really something worth watching, and both Kailash Satyarthi and Malala Yousafzai gave great speeches that I’d recommend either reading or watching. 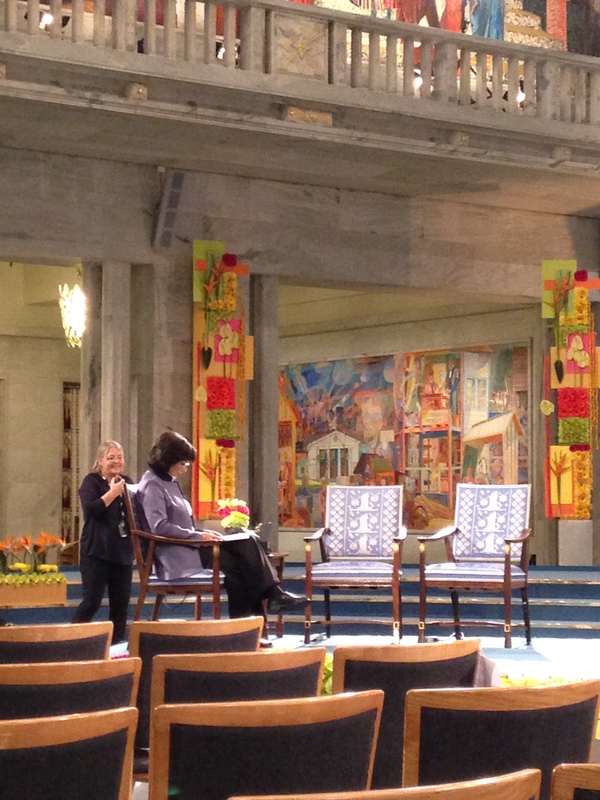 After the ceremony ended I made my way over to City Hall for the CNN interview. Getting into City Hall was similar to going through airport security, but overall it wasn’t too bad. In it, Malala talks a bit about how her family has supported her, her funny attempts to stop fighting with her brothers, and more. 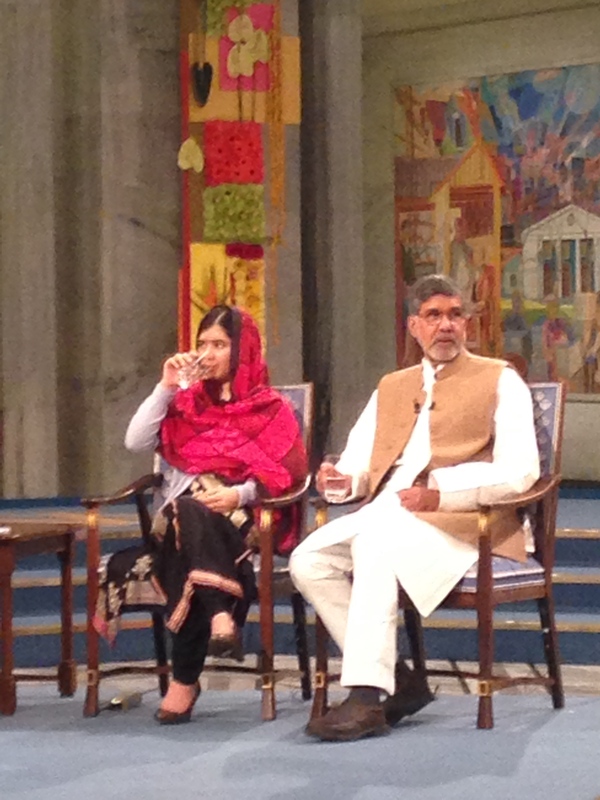 And while Malala has rightfully received a good amount of attention over the Nobel Peace Prize, I would also really recommend looking into Kailash Satyarthi a bit more if you haven’t already. He has also done some incredible things even if they have not received as much attention in the media. 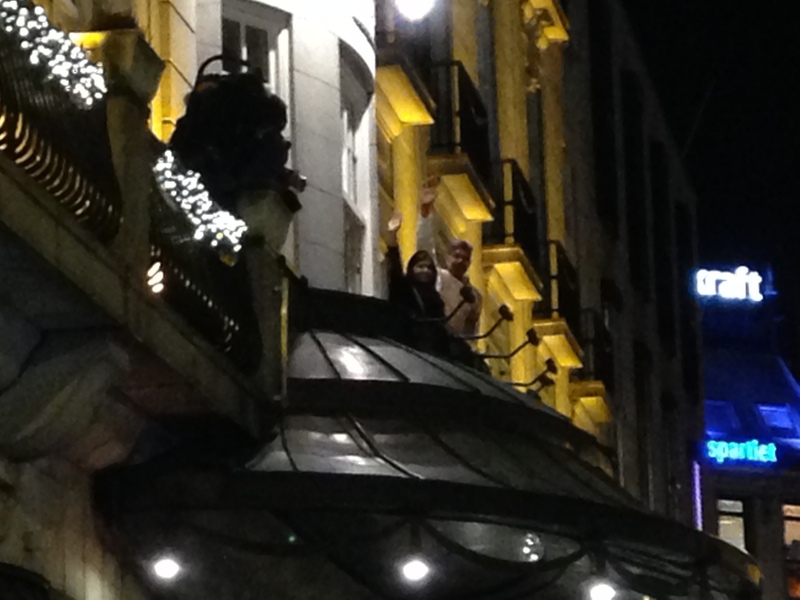 Later in the evening, Kyle and I went to the Grand Hotel on Karl Johans Gate to see the lauretes one last time and to meet with Alyssa. 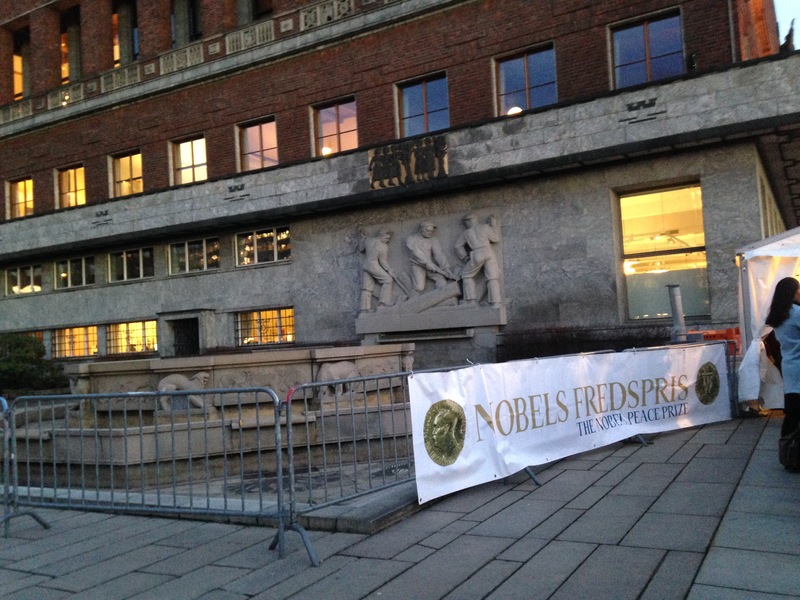 Here the Nobel laureates traditionally appear on the balcony at 7 pm to greet and receive a standing ovation from the crowd. Kyle and I duly paid our respects to the laureates and then headed off with Alyssa to catch up a bit more and to unwind. Needless to say, the day ended up being a truly breathtaking experience.